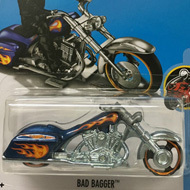 66/250 is a 2016 Treasure Hunt and 1/5 in the HW Ride-Ons series. 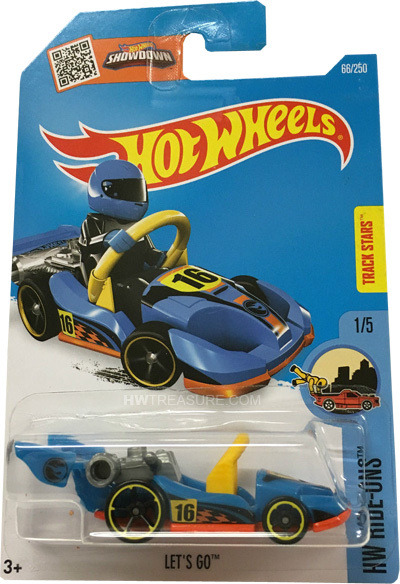 The blue car sports black & orange checkered graphics on the sides, a black “16” inside of yellow on the front and sides, and the Hot Wheels logo on the rear wing. The low production symbol appears on the nose and on the sides of the rear wing. 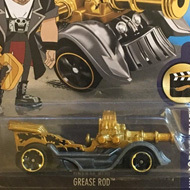 The car has a yellow steering wheel, Open-Hole 5-Spoke wheels with yellow rims, and an orange plastic Malaysia base. Let’s Go made its debut in the 2014 HW Race series. It is a an open-wheel racing car designed to have a LEGO figure as the driver.